Northern Sporades guide - Sailing the northern Sporades islands - yachting Sporades - Skiathos yacht charters. The Northern Sporades - Βόρειες Σποράδες is the proper name for what people usually merely call the Sporades, and consist of the scattered (hence: sporadic) remote and fertile islands of Skiathos, Skopelos, Alonissos, Skyros, Pelagos or Kira Panayia and the uninhabited Peristera, Skantzoura, Yioura, Piperi and Psathoura. In contrast, the less travelled Eastern Sporades refer to the sailing area that includes the islands of Lesbos, Limnos and Chios, which string along the Turkish coastline. The bigger islands in the Northern Sporades sustain small populations - mostly of craftsmen, farmers and fishermen - and the only proper towns double as ports: Skiathos town, Skopelos town, Patitiri on Alonissos and Linaria on Skyros. Moreover, on Skopelos island Glossa (via Loutraki port) and on Alonissos island Steni Vala port are also well worth visiting, especially to look for good tavernas in the typically narrow winding streets. But also near the popular beaches on Skiathos and Skopelos you will find lots of tourists in the season, yet as a rule the tavernas and bars tend to be twice as expensive and half as good as in the traditional places. Indeed, five or six beaches on Skiathos and Skopelos are considered the best in the eastern Mediterranean and near the ports these beaches can be crowded, however if you have your own yacht there are an abundance of stunning bays to drop anchor where you will be all by yourself. If fact the Northern Sporades are as famous for the beautiful scenery and beaches as for the amount of secluded anchorages and wildlife, hence ideal for yacht charter holidays. 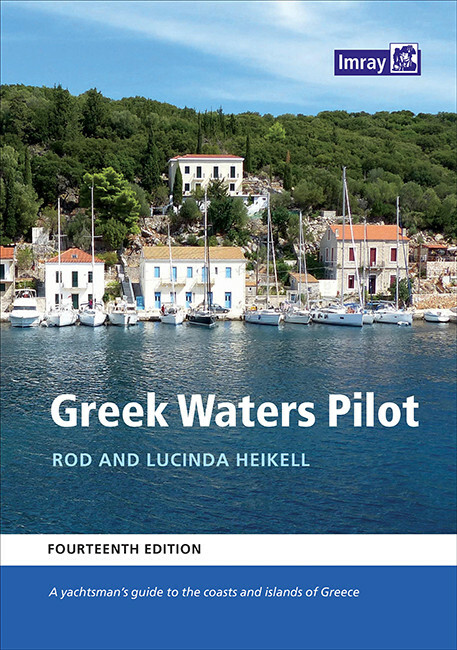 For this sailing area the ultimate charter base is the marina in Skiathos port, which even seems to have its own airstrip (planes landing will nearly touch your mast). 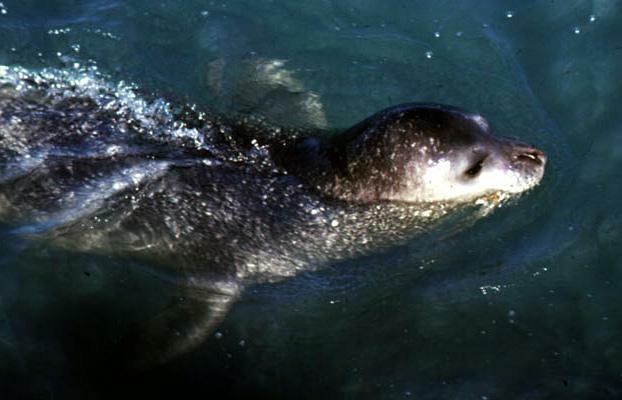 The National Marine Park of Alonissos in the Northern Sporades (NMPANS) measures 2200 km² and was - much too late - set aside in 1992 by the Greeks for the protection of the unique ecosystem and, particularly, the Mediterranean Monk Seal (Monachus monachus), which symbolizes the Park's identity. Although the park harbours the largest surviving colony in the whole Mediterranean, the population of Monk Seals around these shores consists of a mere 50 individuals, which makes this animal one of the world's most endangered species! The NMPANS is divided in two larger zones (A & B) plus an important core zone (C), with varying degrees of protection. Zone A consists of Pelagos (Kira Panayia), Yioura, Piperi, Psathoura and Skantzoura, and several smaller islets as well as the surrounding waters. 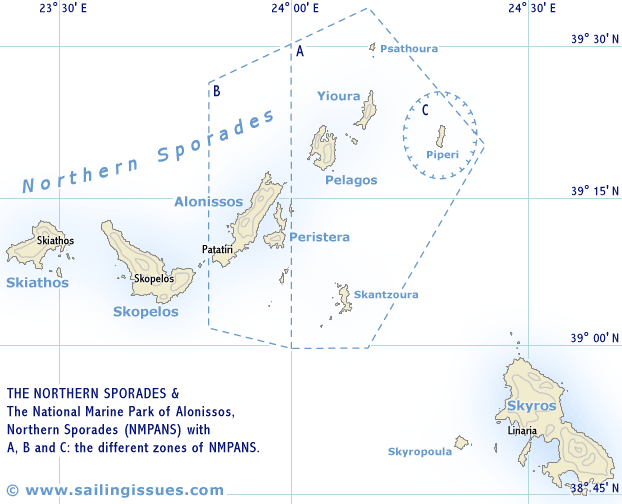 Zone C - the Core zone of the NMPANS - is situated largely within Zone A and focuses on the uninhabited island of Piperi and a three nautical mile marine area around it. All human activities in the core zone, except scientific research with special permit, are prohibited. Special protection measures have also been taken for Yioura, where yachts and tourists should keep a distance of 400 metres. The remainder of zone A has fewer restrictions and is basically open to tourism and to small-scale coastal professional fisheries, but is prohibited for certain cargo-vessels. 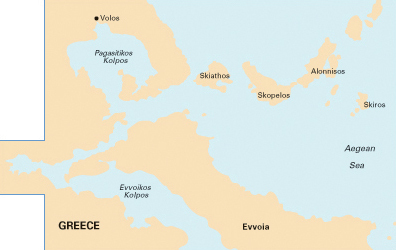 Zone B includes the only inhabited island of the NMPANS, Alonnissos (Alonisos, Allonisos), several smaller islands and the marine area around them. Apart from regulations on special fishing techniques, most activities are permitted in this zone. Except for Skyros - where the Cycladic influences with cubed white-washed houses is clearly visible - the Northern Sporades boast quite a different architecture. Especially in Skopelos the building style, which is so typical of Macedonia and the adjacent mainland, has left its mark (see image on the left). The houses - all having in common their verandas, balconies and courtyards full of flowers - are surrounded by narrow stone built alleys and whitewashed climbing steps. Due to earthquakes and some degree of neglect the old Venetian houses are rare. Skiathos likewise doesn't follow the functional and traditional Cycladic building techniques. Skiathian houses are traditionally divided in a ground floor used for storage and middle and upper floors for residence. Unfortunately not many of these houses have survived, but for newer buildings the traditional ceramic tiled roofs, multi-coloured shutters and small balconies are still used, and blend in perfectly with the existing town's atmosphere.